156 pages, 8.5x11, spiral bound. Shortly after embarking on a personal study of items of undelivered Canadian mail, Brian Plain discovered that there was no comprehensive reference dealing with the Dead Letter Office in Canada. What little information was available consisted of a few articles in philatelic journals and the occasional mention in a book. Only after several years spent combing through dealers' stock, tracking auction sales, and researching material did a clear picture of this rather obscure postal service finally emerge. 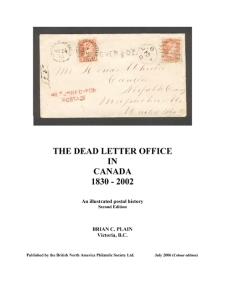 At the prompting of philatelic friends Brian decided to collate his findings in a book, The Dead Letter Office in Canada 1830-2002, published in 2003 by Auxano Publishing. More than 100 pages of Dead Letter Office history were illustrated in colour by many covers, some unique, and complemented by the first ever identification of DLO handstamps by type as well as 23 pages of tables listing known DLO cancellations. BNAPS is pleased to present the second edition. Not only have the listings been expanded by seven pages but the numbering system has also been completely revised so that it can be used for future reference in articles, books and catalogues. The primary purpose of 'The Dead Letter Office in Canada 1830-2002' is to make collectors aware of the history and operation of the Dead Letter Office. Students of BNA postal history should find the information provided will assist them to more clearly define the travels of a mailed item. For town cancel specialists, the databases provided will help identify markings they might wish to pursue for their own collections. The author hopes that his small contribution to the philatelic literature of Canada will be of benefit to a wide range of collectors, and that it might serve to stimulate more interest in collecting 'back of the book' material.